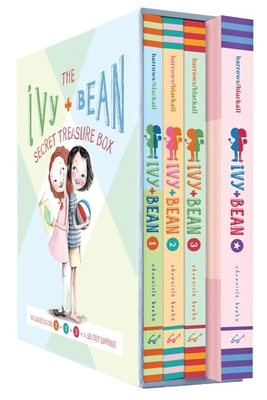 Book 1: Ivy + Bean: Both girls were sure they would never like each other, but when Bean finds herself in a pickle, Ivy helps out with a magical spell. The results are glorious: Bean's sister Nancy loses her mind, and Ivy and Bean become forever friends. Book 2: Ivy + Bean and the Ghost that Had to Go: Ivy discovers that there's a ghost in the girl's bathroom at Emerson School. What could be cooler? Nothing, until the teachers find out, and Ivy gets in trouble. The girls have to get rid of the ghost, and quick. Potions-and plumbing-come to the rescue. Book 3: Ivy + Bean Break the Fossil Record: Bean wants to break a world record, but all she seems to be breaking is dishes. Out in Bean's backyard, Ivy and Bean dig up a pile of ancient bones and discover that they are record-breakers: they're the youngest paleontologists in the world! The problem is that nobody believes them.